The opening of the Duisburg Merkez Mosque on Oct. 25 in Germany was a great day for the country’s Muslims, as it provides room for more than 1,200 people to pray and is currently Germany’s largest Muslim place of worship. With a highly decorated main central dome (measuring 23 meters in diameter) and a number of equally impressively decorated half-domes as well as a 34-meter-high minaret pointing up to the sky, the mosque was built in classical Ottoman style in the western German federal state of North-Rhine Westphalia and is reminiscent of İstanbul’s famous Hagia Sophia. But it was not only the extraordinary size of the house of worship that made the event so important. Rather, what stood out was what preceded the inauguration of the building and the three years of construction as well as the absence of accusations so often used to undermine other mosque building plans in Germany. So what made the difference? Can Duisburg be called a prime example of successful integration? Sunday’s Zaman decided to find out. Mosques for Germany's many Turkish communities are often the subject of various zoning disputes, a source of tension between native Germans and Turkish immigrants. In hopes to allay those tensions, some have suggested finding more amicable approaches to mosque construction, e.g. 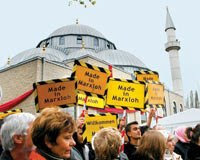 constructing mosques that fit more naturally with German architecture, integrating Turkish and German design.